Open source software platform for management and discovery of servers, applications and systems for Hybrid IT. 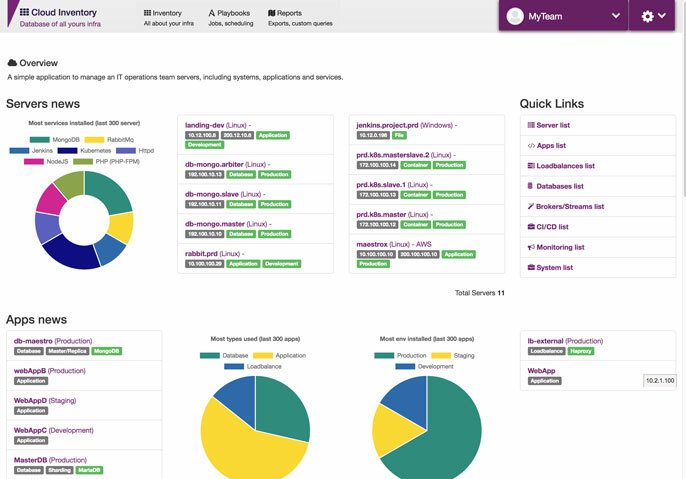 Maestro was built to solve some problems faced in the operation of multicloud environments, multi-shared devops culture and multiple clients, where it becomes hard to (a) keep track of the lastest environment state, (b) apply a compliance in all teams, (c) accurately visualize your infrastructure state, (d) manage access for internals employees and (e) maintain the documentation up-to-date. How can we audit our environments? How can we control and keep track of our environment? How can we guarantee if our documentation is up-to-date? Which servers belong to a given client? Maestro comes to (a) help IT operation teams to organize and audit multicloud infrastructure; (b) substitute CMDB systems; (c) enable continuous discovery of servers, services and apps; (d) classify each service as a database, message queue, VPN, API gateway, service mesh, etc., and; (e) create a relation between servers, services and clients. Maestro comes for you, to be a complete and simple cloud inventory. Analyse your full state environment of all providers do you have, centralize all information about datacenters, servers, loadbalance, orchestrations tools, volumes, vpns and etc. Do you like to experiment how maestro is? Demo verson is a complete open source installation. Interested in developing Maestro Server, create new features or extend them. We create a set of documentation, explain how set up your development environment, coding styles, standards, learn about the architecture and more. Welcome to the team and contribute with us. Open source software platform for management and discovery servers, apps and system for Hybrid IT.